Are you looking for a family-friendly campground in popular Sturgeon Bay, Wisconsin? The Harbour Village Campground and Water Park is ready and waiting for you! Door County, Wisconsin is a popular vacation destination situated on a peninsula between Lake Michigan and Green Bay. Travelers flock to the area to enjoy the miles of shoreline, parks, and calm waters at Nicolet Beach. Harbour Village Water Park and More! Home to Door County’s largest water park, Harbour Village Campground and Water Park has two 350-foot water slides, a 2,000-gallon activity pool, a children’s splash pool, and a hot tub that is exclusively for adults. To keep you fueled and afloat, the Snack Shack alongside the pool offers hot food and cold drinks and is open weekends from Memorial Day to Labor Day. Other fun-time amenities are a swimming pond, an adult pool, pedal carts, disc golf, archery tag, a jump pillow, a jump shot, shuffleboard, horseshoes, a hiking trail, a fishing pong, and an assortment of games and scheduled activities. From select free days at the water park to live entertainment, fireworks, DJ days, costume contests, and pig roasts, the ways to have fun during your Harbour Village Campground and RV park vacation seem almost endless. And to ensure your creature comforts during your camping vacations, this resort park has a well-stocked camp store, golf carts, shower and bath houses, and laundry facilities. Whether you are looking for a wooded site to back-in your camper or a wooded pull through site, Harbour Village Campground and Water Park offers roomy locations that fit your needs. The campground also has non-wooded back-in sites, a tent village, primitive ten camping, and campsites with extra privacy and no amenities. 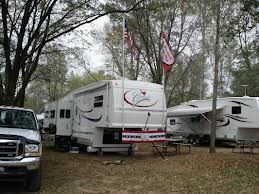 Wooded sites are sanctuary-like locations, while non-wooded sites are great for families and friends camping together in multiple trailers or campers, or anyone who prefers open, grassy areas. And all the tent camping sites are serene spots to pitch one tent or a cluster of tents. Both 30 and 50 AMP electric hookups are available, along with two free-to-dump stations, pump-out services, garbage and recycling bins, and water conveniently near most sites. For vacationers who prefer the cabin camping experience, rental cabins are available to sleep either four or between eight and ten adults. 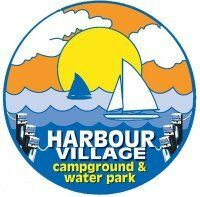 Contact Harbour Village Campground & Water Park Specialist Today!